Pathological liars can be very skillful. For a person who is a pathological liar, treatment success varies. It depends on how motivated the liar is to change his or her ways. Some research in this area indicates that the problem of compulsive lying may have a biological component. Pathological liars are people who tells lies when there is no clear benefit for them to do so. An individual who is not a pathological liar may lie to avoid punishment or ridicule. He or she may be less-than-truthful to avoid hurting someone else. When the problem of lying is at the point where the person is unable to control it, that person is considered to be a pathological liar. Even though pathological lying isn't listed in the Diagnostic and Statistical Manual of Mental Disorders ("DSM-IV"), it is considered a disease by some experts. Pathological lying can exist as a symptom of another disorder such as Attention Deficit and Hyperactivity Disorder (ADHD), Obsessive Compulsive Disorder (OCD) or Antisocial Personality Disorder (ASPD). The results of a 2005 research study published in the British Journal of Psychiatry indicates that the brain of a person who is a pathological liar is different from that of an individual who doesn't have this issue. Compulsive liars have more white matter and less gray matter in their prefrontal cortex. The prefrontal cortex is the portion of the brain that is responsible for decision making and behaving in a socially-acceptable manner. Brain scans conducted on pathological liars indicated that they have approximately 26 percent more white matter than people who have psychological disorders but don't lie compulsively. 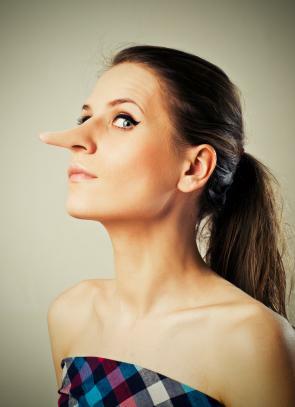 The study results indicate that people who lie are more skillful at the art of doing so and are less likely to either appreciate or care about the morality of lying. When it comes to pathological liar treatment, psychotherapy can help. The problem with trying to treat people with this problem is that they often won't or can't admit that they have issues around telling the truth. A "normal" person knows when he or she has lied, but the pathological liar may not be able to differentiate between the truth and a lie. Often, the pathological liar believes the stories he or she has concocted, no matter how grandiose they may seem to the people around them. If the liar is in a highly-emotional state, he or she may manufacture false memories to support the lies that have been told. Cognitive behavioral therapy can be helpful in treating people who are pathological liars. With this approach to therapy, clients learn how to identify the situations and the kinds of thoughts that make them resort to lying. Once these people are able to understand when they are likely to lie, they can begin the work of learning how to behave in a different way than in the past. In the case of a pathological liar, the person needs to be screened for other personality disorders. If the person is lying due to a psychological issue that can be treated with medications, prescription drugs may be part of the treatment plan. A combination of medication and psychotherapy can help a compulsive liar to stop lying routinely. If the person undergoing treatment is not deeply committed to changing his or her life, treatment will not be effective. In the case of people with Antisocial Personality Disorder (ASPD), their sociopathic tendencies make it very easy for them to lie and attempt to manipulate the therapist who is working with them. They may lie about taking their medication and how effective it is in helping them to change their behavior. To learn more, read LTK's Compulsive Lying Treatments Interview with counselor Adam Szmerling.